Yesterday I had brunch at a quaint and adorable inn. I have become someone who goes to brunch. It seems like a sophisticated thing to do. I believed I caved into peer pressure because everyone in the Washington DC metropolitan area does brunch. My one complaint with brunch is I'm always ravenous. I don't eat any breakfast when I brunch, and by 10 or 11 I'm famished. I realized I hadn't make chocolate chip cookies for a few month and knew that needed to be rectified. Because I post recipes, I can't make plain Jane chocolate chip cookies. Such pressure! These are special because they have peanut butter chips in addition to chocolate chips. They are also stuffed with miniature peanut butter cups. The peanut butter cup was created by a former Hersey's employee named Harry Burnett Reese. He created his own candy company in the 1920s. After he died in 1956, his company merged with Hersey's on July 2, 1963. The cookie recipe came from allrecipes.com. I have used it before, and it's a keeper. I made half of the recipe. As I mentioned, I stuffed the cookies with peanut butter cups. The ingredients are 1/2 cup softened butter, 1/2 cup white sugar, 1/2 cup packed brown sugar, 1 egg, 1 teaspoon vanilla extract, 1 1/2 cups all-purpose flour, 1/2 teaspoon baking soda, 1 teaspoon hot water, 1/4 teaspoon salt, 1/2 cup chocolate chunks, 1/2 cup peanut butter chips, and 15 miniature peanut butter cups. I estimated the number of peanut butter cups. Each cookie contains one cup. I started by creaming the butter and sugars together. I added the sugars and butter to a bowl and mixing vigorously. I added the egg and vanilla. I stirred until combined. I dissolved the baking soda into the warm water. I'm not sure of the purpose of this step. I stirred the dissolved baking soda into the creamed sugar and butter mixture. I stirred the flour into the batter. I added the peanut butter chips and chocolate chunks. I flattened a glob of dough. I placed a peanut butter cup in the center of the dough and squished the dough around the candy cup. I repeated this step until there was no dough remaining in my bowl. I placed my dough in the fridge for a couple of hours so it was more manageable. I placed the cookie mounds two inches apart on a greased baking sheet. I baked the cookies for ten minutes at 350 degrees. They cooled for a few minutes on the baking sheet before cooling completely on a wire rack. The cookies were buttery, golden, and chewy. The edges were slightly crispy and caramelized. 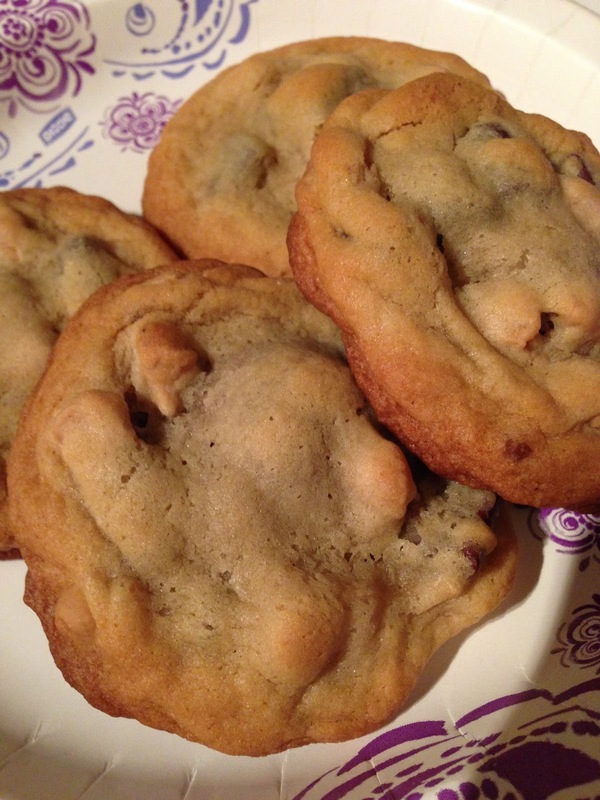 The candy centers were gooey and creamy when the cookies were warm from the oven. 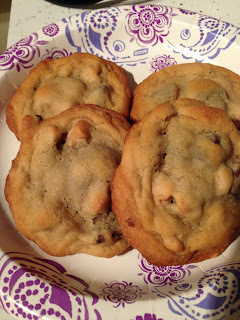 Each cookie was overflowing with sweet and rich chocolate chunks and peanut butter chips. The cookies were simple and friendly but a little decadent too. I wish I had a few right now to nibble on. They were delectable. There's nothing better than chocolate chip cookies, unless they're stuffed with peanut butter cups! These look delicious!